Running in the early morning to reach this place. I’m set to meet Niall at 7:30 AM in his place. 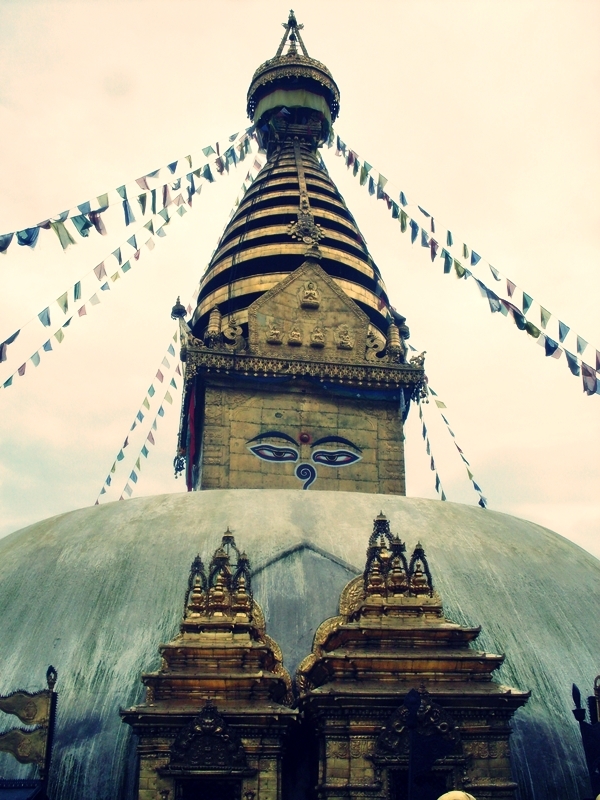 This time not for usual web design work but for running to the monkey temple (Swayambhu). I didn’t realize that traffic jams are less in the mornings so I reached there early at 7:15 AM. After sometime we were off to the monkey temple with a water bottle in our hands. We started running from the middle of Thamel. We even started getting occasional strange looks from people. As we were running up the hill towards the temple I was really tired. 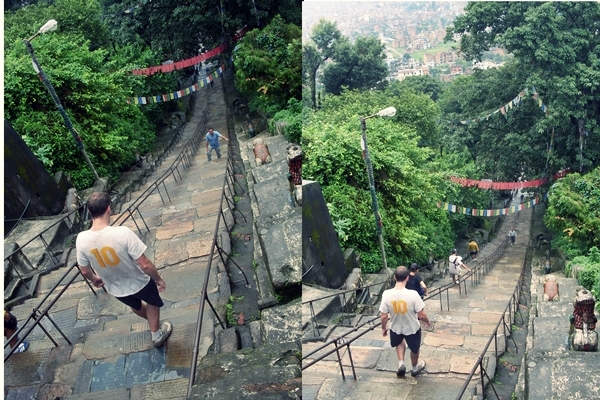 So, we walked till monkey temple from there and then started running from the bottom of stairs to the top. I reached there with occasional breaks and sprints up the steps. Doing that is really painful and felt like I’m about to die but later it started to feel healthier. It’s same with anything we try and get better at. After Niall was done with sprinting we sat down at the bench where tourists pay money to enter the monkey temple. For sometime, we were just enjoying the view from top of the monkey temple. We were watching the horizon and the whole KTM city below the clouds and mountains in the early morning. What a way to start the day! 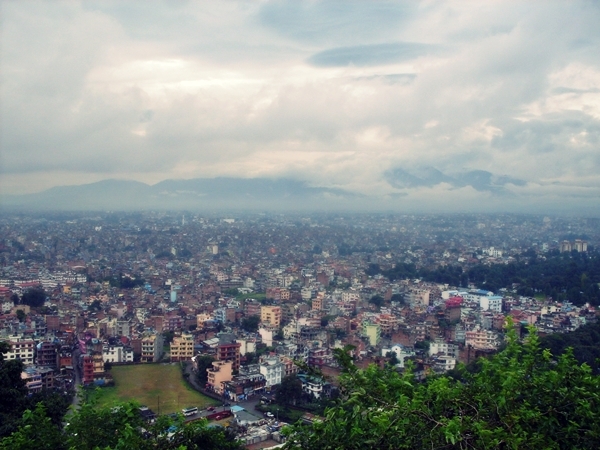 This is how it looked like Overlooking KTM city from the Monkey Temple. Watching the mountains below the clouds and whole KTM city below it was really awesome. While we were chatting I somehow brought the topic of risk and told him that most old people regret not taking risk early in their life. He agreed with the statement and added, “It’s risky to not take risk”. As soon as I heard that sentence I had in mind that it’s going to be the title of my next blog post. If you don’t take risks, you put your future in serious danger. You can’t get what you want in life without taking risks. The main reason we hesitate to take risks is because of it’s label and image we have created in our mind. We think that taking risks means imminent danger. We think of risk as just a one shot do or die situation. Most of us think that if we take risk and it doesn’t turn out the way we expect it to be, then that’s all over. We hesitate to take risk and act as if the sky will fall or we will die if we take risk. It’s all because of that one shot do or die mentality that prevents us from taking risks. The way to becoming more prone to taking risks is to change the way you view risk. I especially like Brain kim’s take on taking risk.. Instead, start thinking of risk as a journey of exploration. It’s not just about one shot. It’s about a journey, a journey you choose to embark on for the purpose of exploring a different path. Columbus did not take a risk. He chose to go on a journey to explore the new world. Entrepreneurs don’t take risks. They choose to go on a journey to explore other means of making a living. Companies don’t take risks. They choose to explore doing things differently than the norm. Step back and look at the forest. Don’t look at the trees. Risk is not just about looking at one tree. It’s about exploring an entire forest. If you start labeling risk as a journey of exploration and discovery, it takes the weight off your shoulders and you become more inclined to take action. Go on a journey of exploration and focus on your desired outcome. When successful people reflected on their major crossroad in life, they almost always noted an element of risk involved—they had to move toward something they wanted in spite of fear. It became evident that at the end of our lives we will not regret risks we took that did not work out as we hoped. Not one person has said they regretted having tried something and failed. Yet most people have said they had not taken enough risks. Knowing that we will likely regret the things we did not try can have a significant effect on how we make decisions. Failure, it appears, is not the regret that haunts most people; it is the choice not to risk failure at all. What we call “mistakes” often turn out to be the moments of greatest learning. One way to frame this idea is that we can never guarantee success in our lives, since every attempt at anything holds within it the possibility of failure. If we love, there is always the risk of rejection. If we follow a dream, there is always the possibility of falling short. We cannot guarantee success, but we can guarantee failure merely by choosing not to try at all. Choosing to take a risk, however small, can have far-reaching implications in the course of a human life. Risks can have lifelong returns. I took a risk in 2010 with same ideology of risk. I and one of my friend started DVD business. We didn’t make too much out of it but the risk was worth taking because we were able to build networks, meet lots of different business people and learn more about business. I didn’t start business expecting to earn too much profit rather I started to explore the business system I was interested in because all events of wealth or success are precluded by process, a backstory of trial, risk, hard work, and sacrifice. Actually, It’s easier to live in regret of failure than in regret of never trying. Working with DVD, Flaps and covers. 2010. Yes, I failed to earn profit from that particular business. You can’t experience success without failure. Failure is simply a natural response to success. If you avoid failure you will also avoid success. You can’t drive the road to success with the brakes engaged. You have to take risks. You have to get uncomfortable. You have to get out there and fail. What causes this fear of failure? Fear of failure is attributed to an overestimated worst-case consequence analysis. outcomes or consequences: intelligent risks and moronic risks. brakes is a moronic risk. Gambling a month’s salary at the craps table is a moronic risk. When you take intelligent risks and avoid the moronic ones, you amplify your success through time. Intelligent risks have a limited downside, while their upside is unlimited. Moronic risks have a bottomless downside and their upside is limited, or short term. Below is the Video of Niall in the middle of the stairs in Swayambhu. 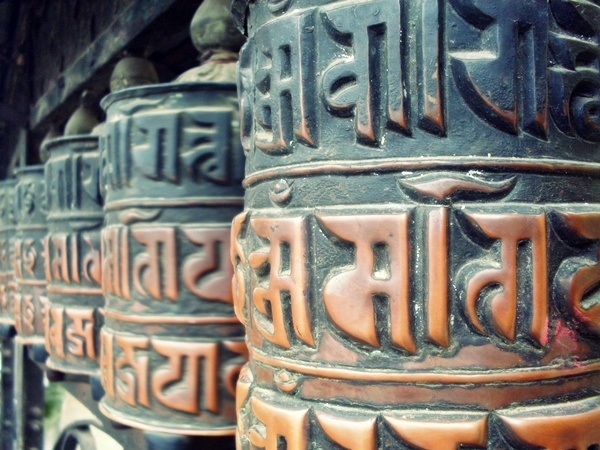 This was recorded some months ago for his blog post, Mornings at Swayambhu. Since I was writing about the same thing thought of posting this video so that you can get glimpse of it. Look at the monkey temple and those breadth taking views. It made me smile in the early morning. I simply love the way you blend adventures into posts. Yes, It’s risky to not take risks. I want to be there right now. It’s looks so nice and beautiful. That’s what I love about Monkey Temple. Everything makes sense once I go there. You made it clear. I should now consider taking risks. Or else I will surely regret not taking risks as you stated.